I know your time is precious. Your day is busy. So is mine. I hope you will make time for this. I took about an hour out of my day to write this. I would like to ask you to give an hour or so of your time to what I'm about to share. If you have to break it up, that's fine. If you can sit down and go through it all at once, that's even better. Before you keep reading you should pray for guidance, wisdom and protection. Be sure these spirits are from God (1 John 4:1). You should all pray for that every day anyway. I think it is best to start with an old video that is a really quick summary of some of the weird stuff involved this Pizzagate story you may have heard about. It's by Really Graceful. Watch it - it's like 5 minutes. She also has a book and a huge twitter and Youtube following. She has done dozens of videos just on this story. While there are many other excellent reporters on this (like David Seaman, formerly of Huff Post, who was invited (twice) to be on the Daily Show to discuss Pizzagate, before that was shut down by someone above Comedy Central's pay grade - https://www.youtube.com/watch?v=LjK6hRPy6zI) and more. Anyway, Really Graceful appeals to those of us who are only sharing the controversial opinion that "Hey - I think some kids might be in trouble. They should look into this." Watch her video before you read further. I know, it isn't going to win any awards - but it seemed honest, didn't it? That David Seaman video was good too, right? Okay - you can come back to that one later, but note he points out some of the extreme hypocrisy in the non-reporting of this story. Remember, before now you thought this was a joke about a shooter at a pizza place. Seriously... watch the videos before you continue. I think, as a friend, you can give me twenty minutes of that hour you promised. Lots of children could be in very serious trouble. You don't have anything more important to do, do you? I understand if you have completely written me off as a nut-job at this point. But it gets a lot weirder. 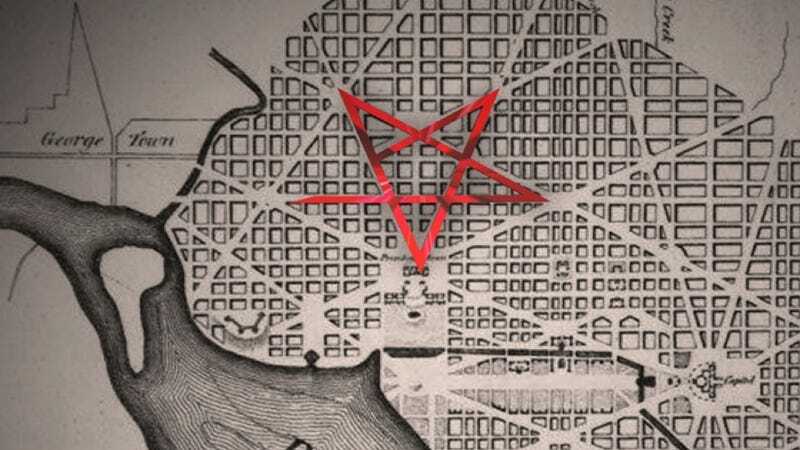 Sidebar, there is a pentagram found in the layout of the city. Did you know DC was laid out in the shape of a pentagram? Now you do. I don't want to spend too long going down the satanist rabbit hole, but occultists say that a pentagram is sometimes left broken (incomplete, with one section missing) so that the summoned evil can escape from the altar. Here's another look at the streets in DC. The White House is at the bottom. Researchers have continued to dig (pun definitely intended) into the tunnel issue. They found the kill room. They matched various images to show connection between the Alefantis Instagram pictures and a nearby place called the Pegasus museum. The house out in front of that building has one word painted on the wall: "Kids"
I'm going to say he more than made up for any sin in selling those shirts. He and others had investigated and tracked down connections between images in James Alefantis' Instagram and worked out the address for the killroom. He made a Youtube video and shared it. It was quickly removed for alleged "violation of Youtube guidelines." (I watched the video and my legal opinion is that there was zero violation of Youtube's guidelines). Later, the guy came back with a new video explaining why he deleted the video - which includes the content of the originally deleted video. p.s., They've been shutting down youtube and twitter and facebook posts about this. But they're actually coming after some of the most outspoken people, like David: https://www.youtube.com/watch?v=sOIxgTTrtM0 and friends.